What could be more appropriate than the final chorus from the oratorio Bach wrote for Good Friday, the Passion of St. John? Ruhn bis am juengsten Tage! rest until the last day! my Savior and Throne of grace! I will praise You eternally! Jesus answered, . . . "Everyone who belongs to the truth listens to me." After he had said this, he went back outside to the Jews and told them, "I find no guilt in him. But you have a custom that I should release one man for you at the Passover. So do you want me to release to you the King of the Jews?" They cried out again, "Not this man, but Barabbas!" Now Barabbas was a robber. Then Pilate took Jesus and flogged him. And the soldiers twisted together a crown of thorns and put it on his head and arrayed him in a purple robe. They came up to him, saying, "Hail, King of the Jews!" and struck him with their hands. Pilate went out again and said to them, "See, I am bringing him out to you that you may know that I find no guilt in him." So Jesus came out, wearing the crown of thorns and the purple robe. Pilate said to them, "Behold the man!" When the chief priests and the officers saw him, they cried out, "Crucify him, crucify him!" Pilate said to them, "Take him yourselves and crucify him, for I find no guilt in him." The Jews answered him, "We have a law, and according to that law he ought to die because he has made himself the Son of God." John's account of Jesus' trial is full of ambiguities. 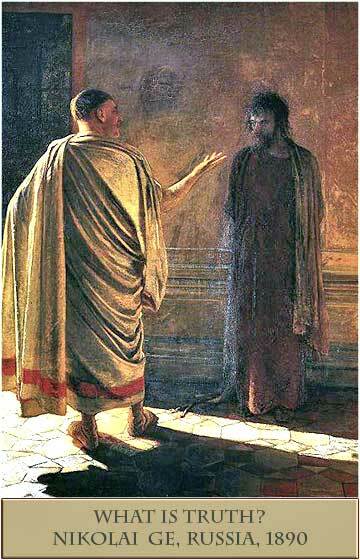 But it seems that Pilate did not believe Jesus was guilty of any breach of Roman law. He was obliged, however, to cooperate with the Sanhedrin, of which the High Priest Caiaphas was the leader. Where Roman law was not involved, he would cooperate in enforcing local laws. Pilate is a bit fascinated by Jesus. He appears to have been schooled in Greek philosophy and he wants to take the opportunity to engage Jesus in dialogue. When Jesus tells him that he has come to tell people the truth, Pilate responds with the cryptic question: "What is truth?" It's a very Greek question, the kind of subject that philsophers would spend hours and days at a time debating. But we do not have any record of a response from Jesus. 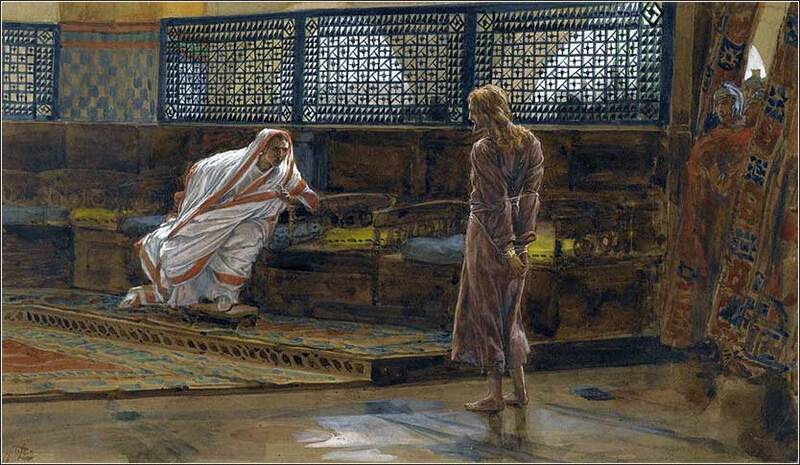 Pilate tries to save Jesus' life by offering to release him under the custom, that one criminal should be set free at Passover. The crowd of urban Pharisees and Sadducees, however, is intent on seeing him killed, and demands the release of the thief Barabbas. Also clear from John's account is that Jesus is depicted as an innocent sacrifice. At passover, the most innocent of animals, an unblemished lamb, was sacrificed. (Exodus 12:3) This commemorated the Hebrews in Egypt painting their doors with lambs' blood, so that the spirit sent to kill the eldest male child would pass over their houses. Exodus recounted freeing the Hebrews from slavery on earth; Christ became the sacrificial lamb, in order to free the Hebrews and the world from the slavery of sin.